Nearly 50 years ago, the Calder Hall nuclear reactor, in West Cumbria, was plugged into the national grid for the first time. At that time, nuclear power was seen as the fuel of the future: clean, cheap and potentially unlimited. 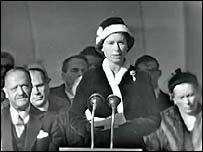 In her dedication speech, the Queen said mankind was on "the threshold of a new age", thanks to Britain's "atomic scientists". It would have seemed incredible to the dignitaries present that day, that in the first decades of the 21st Century Britain would be looking increasingly to wind power and natural gas, imported from Russia, to provide its energy needs. In the 1950s, coal was king. A vast nationalised industry kept the lights on, the factories running and hundreds of thousands of largely Labour-voting families in reliable, if backbreaking, work. The arrival of North Sea oil in the mid 1970s was a welcome boost to a cash-strapped Labour government, turning the UK into a significant exporter of energy. But the politicians retained a tight grip on supply. Energy policy was seen as far too important to leave to the market. All that changed in the 1980s, with the Conservative privatisation of oil, coal and electricity generation. The newly privatised power companies made a "dash for gas", building several new gas power stations and reducing their demand for coal. This heralded the start of a rapid decline of the UK's pits - leading eventually to the closure of all Scotland's mines and all but one in South Wales. Gas was seen as a cleaner and cheaper alternative to coal, but the left suspected a Conservative plot to rein in the unions, in the wake of the 1984 miners' strike. Labour came to power in 1997 with a commitment to halt the "dash for gas" and creating a "level playing field" for coal and gas prices. But the moratorium was short-lived and the coal industry has continued to shrink. There are currently 12 working pits - compared with 170 in 1984 - and the industry's long-term survival is under question. The government has said it remains committed to coal, which still provides about 32% of electricity production. 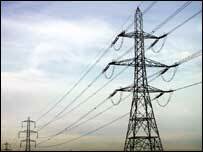 But these days UK power stations are just as likely to get their supplies from Eastern Europe. In its 2003 energy white paper, Labour restated its commitment to a "liberalised", deregulated and global energy market. Consumers and energy producers will decide the future energy mix, with the government's role confined to setting long-term targets and policy. And the biggest priority, according to the white paper, is the environment and the creation of a "low-carbon economy". The UK is legally bound, under the Kyoto Protocol on climate change, to reduce emissions of greenhouse gases by 5.2%, below 1990 levels, by 2012. In his foreword to the 2003 white paper, Tony Blair states: "We are showing leadership by putting the UK on a path to a 60% reduction in its carbon dioxide emissions by 2050." Environmental campaigners, such as the Green Party, say the government should commit to reducing emissions by 80% if it is serious about reversing global warming. But there is a question mark over whether the government can achieve even its existing targets. In 2002, UK emissions of carbon dioxide - the main greenhouse gas causing climate change - were 1.2% higher than in 1997, according to government estimates. Declining reserves of North Sea gas and oil mean that by the end of the decade, the UK will be a net energy importer for the first time since the Industrial Revolution. Ministers plan to step up imports of oil and gas, principally from Russia, in an effort to plug the gap. They also plan massively to increase investment in renewable energy, such as wind and tidal power, which ministers say will provide 20% of Britain's energy needs by 2020. Last year, Trade Secretary Patricia Hewitt unveiled plans for the world's biggest wind farms, at three sites off the coast of England. But critics say this will not be enough to bring down carbon emissions. Increasing nuclear power production - still responsible for 23% of supply - would be guaranteed to bring down CO2 emissions. But the industry appears to be in long-term decline. By 2025 there will be just one nuclear power plant in operation in the UK, and the government currently has no plans to build any replacements. 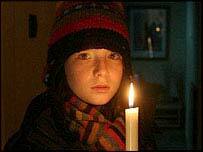 Will future governments have to deal with power cuts? Although the government has stopped short of declaring an end to the nuclear age, the cost of cleaning up decommissioned reactors has proved too great for the market to stand. The near financial collapse of privatised nuclear operator British Energy last year, after it reported £4.3bn losses, may prove to be the final nail in the industry's, no doubt lead-lined, coffin. Environment secretary Margaret Beckett insists the UK is on course to meet its 2012 Kyoto targets, without new nuclear plants. But it will be relying heavily on greater energy efficiency, still seen as the best way to cut both heating bills and carbon emissions. The first big test of this, observers say, will be the boom in "affordable private housing" planned for the South East of England. One final concern for policymakers, is the UK's choice of overseas suppliers. Last year, BP signed a £3.6bn natural gas deal with Russia, transforming the UK, at a stroke, into that country's biggest foreign investor. A new North European pipeline, running through the Ukraine and Germany, could eventually "provide a much more direct route for Russian gas to the UK", according to 2003's white paper. The UK has also signed deals with Iran, Libya, Algeria and Iraq, and the government says it will "continue to engage with the Caspian, Middle East and African countries" to develop potential supplies. But the Institution of Civil Engineers (ICE) has warned the UK could face power cuts in 20 years' time, because it will depend so heavily on foreign energy sources to produce its electricity. The institution says 80% of the gas needed to fuel British power stations will come from distant and "politically unstable" countries by then. UK energy policy, for so long a relatively uncontroversial area, looks set to climb back up the political agenda in the years ahead.